jennster's blog: thursday night, also known as THE BEST NIGHT EVER!!!! thursday night, also known as THE BEST NIGHT EVER!!!! so i'm with my friends sandi and mike right now. and after dinner, we decided that we wanted something sweet. i wanted fro yo (per usual), but mike yelled out, "DONUTS!!!!!" sandi and i both looked at eachother and then were like, "OH HELL YES!!!!" and we all practically ran to the car. all three of us wanted the same kind of donut. white cake with white frosting and rainbow sprinkles. yes, we're donut snobs. or we just know what we like. anyway, we get to the donut store and the guy doesn't have any. i whine a little and ask him if he'll make us some. he does, cause he's awesome like that! then i ask him if I CAN make us some?!?! and he says YES! because he is REALLY awesome like that!!!!! imagine my excitement when he opens the donut shop door for me to COME INSIDE and make my own donut!!!!!!! well you don't have to imagine, cause HERE is the proof!!!! so i am really giddy, and jumping around a lot and trying to pose for pictures AND make delicious donuts at the same time. which is clearly much harder than it looks. since i am IN LOVE with donut white glaze frosting stuff, i tried to double dip one of the donuts. you know, cover it entirely in frosting. but that stuff is thick. so um, i used the spoon. 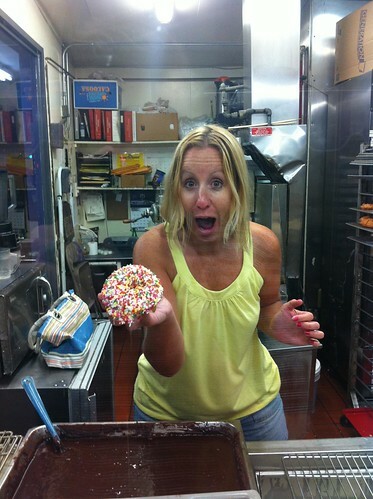 and since the donut was freshly made... can you guess what happened?! it crumbled into a billion pieces in the frosting! and i couldn't save it. this is what a donut fail looks like. but never fear! i'm no quitter! so i tried again! look at all those sprinkles!!!! now that's how a sprinkled donut should look!!! i told the guy that my donuts looked better than his and that if i was a customer, i'd want the donuts FULL of sprinkles, not just barely there. so he redid all of his donuts to match mine! i'm SO influential in the world of donuts. look how happy i am that he is making the sprinkle-ful! thank you marteen! you were so freaking awesome for letting me come in and make my own donuts! Those donuts look soooo yummy! They have you to thank for that purchase. I wonder how many donuts were sold today because of your post? Hee! That is awesome that he let you take over the shop! I would have been mumbling, "Mmmmmm, donuts," the entire time. Lmfao..omg you are such a nerd..love the facial expressions! !